These loans are loans given to obtain a mobile or manufactured home. These dwellings are constructed offsite in a factory and then moved to the property. These dwellings are built to the Manufactured Home Construction and Safety (MHCS) Standards. These homes are clubbed with modular homes where many sections are constructed off-site and assembled on the land or property where they are to set. These may be building blocks at a property or a mobile home fitted on to a permanent chassis. They are becoming popular because the price of construction per square foot is much less than that for the traditional houses. The difference between the manufactured and modular homes is that the modular ones are fixed and permanent and placed on a foundation. As opposed to the mobile homes manufactured to be towed around. These loans are to be amortized over 15 – 20 years for a single or multi-section home. Ask for Title I financing by the FHA even while dealing with private lenders. Non-federal loans can be negotiated with the lender repaid in monthly installments. The interest rate too is negotiable and remains fixed the entire term of the loan. The Federal Housing Administration has less rigorous lending standards and requires fewer down payments and are thus more popular with the borrowers. These loans pay a mortgage insurance that protects the lender from defaults on the loan. If the home is purchased separately from the land it will sit on, then the private property loan is applicable. These loans come with a higher interest rate than the regular housing ones. 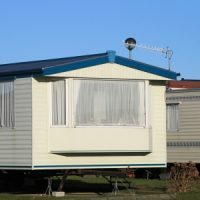 If the manufactured home and land are bought together, then traditional rates are applicable. The terms of the loan may vary from lender to lender. Agencies like the Federal Housing Administration and Department of Veterans Affairs (FHADVA) offer manufactured loans. A minimum credit score of 580 or higher is required to qualify for a down payment as low as 3.5 percent. A credit score of 500 – 579 must be maintained to be eligible for a down payment of 10 percent. People with credit scores lower than 500 are not eligible but the applicants with a “non-traditional credit history or insufficient credit” may be considered if they meet certain requirements. The home construction should date after June 15, 1976. The red HUD label should be affixed to each section. The minimum size should be 400 square feet. To qualify as real estate the house should be permanently affixed to a foundation as per FHA standards. The lot where the manufactured dwelling will be fixed should be approved. This dwelling should be the owner’s primary residence.